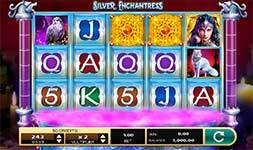 Be spellbound into big winning spins in the thrilling Silver Enchantress online slot from H5G! Set across 5-reels with 243 ways to win, you can win up to $300,000 in a single spin. This mystical new game offers up big rewards through its bonus features that include Free Spins, a wild symbol, Racking Up Riches Feature and Blinking Bucks Bonus. Wild Symbol – The wild symbol substitutes for all symbols in the game and can be found on reels 2, 3, 4 and 5. Free Games Bonus – During the base game, 3 scatter symbols appearing in any position on the reels starts the Free Games Bonus. During the Blinking Bucks Bonus, selecting the Free Games symbol awards the Free Games bonus where you start with 10 free spins. Racking Up Riches Feature – When a winning combination is formed, before it is awarded, all symbols not in winning combinations disappear. The empty symbol positions are filled as symbols fall from above. If any additional symbols were added to a winning combination as a result of the falling symbols, the process is repeated. Blinking Bucks Bonus – During the base game or the Free Games bonus, tumbling 6 or more times on a single game due to the Racking Up Riches feature starts the Blinking Bucks Bonus. Press spin to stop the blinking selection on a random choice of 15 icons. You can win either a coin prize, free spins or the Jackpot round!